Convert MP4 files to WAV online for free now. Unlimited video downloading and converting to WAV. How to Convert MP4 to WAV Online? Select WAV as the output format you want to convert MP4 file(s) to. If your MP4 videos are used only for their soundtrack, then converting it to the popular WAV audio format will save a lot of storage space on your PC. Moreover, there are many media players that do not support MP4 for playing audio, and in such situations converting MP4 to WAV helps. 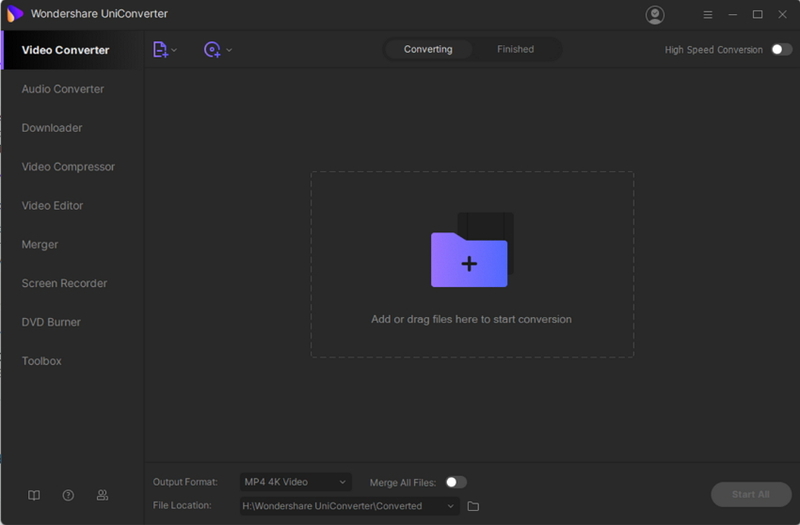 Wondershare Video Converter Ultimate is a complete toolbox for taking care of all your file conversion needs. The software converts MP4 to WAV without any quality loss and works at 30X faster speed compared with similar programs. More than 1000 formats are supported by the program and you can also convert WAV to MP4 and other files. Additionally, the software facilities video editing, video download and recording, DVD burning and other functions. Steps for converting MP4 to WAV using the program are enlisted below. Step 1: Download, install, and open Wondershare MP4 to WAV converter. Download the MP4 to WAV converter and then following simple instructions, install the file. Open the program on your PC/Mac. Step 2: Add MP4 files. To load MP4 videos from the PC to the software interface, click +Add Files from the Convert section. Or you can also simply drag and drop the files. Step 3: Choose WAV as the output format. Open the drop down menu next to the Convert all files to: option, and select WAV format from the Audio tab. Also select the quality of the output file. 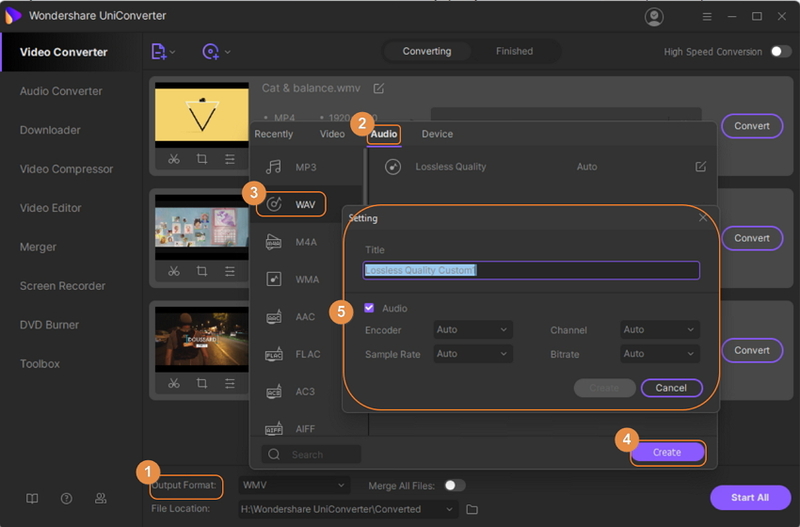 Click +Create Custom that will open a new window for changing Encoder, Channel, Sample Rate, and Bitrate of the output file. Once parameter values are selected, hit Create. Step 4: Convert MP4 to WAV. Select the desired location where you want to save the converted file at the Output tab. Finally, click Convert All to start with the final conversion step of MP4 video files to WAV audio format. Following the above steps, you can convert WAV to MP4. Just load WAV files input option and select MP4 as output format from Video tab in step 3. Convert your MP4 video files in excellent quality WAV format and enjoy your favorite music on all types of players and devices.